What do you remember about 2004? The Athens Olympics? The last ever episode of Friends? Some might recall it as the year that Facebook launched, or that George W Bush won a second term as President of the United States. For Mehari Abreha, 2004 was the year clean water arrived in the barren, mountainous lands of Adi Awanawaza, northern Ethiopia. 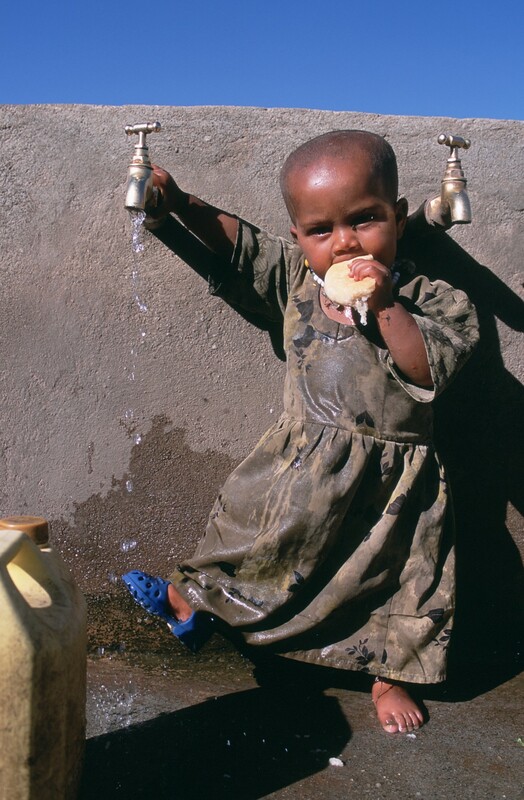 In 2004, no more than 2 in 5 people had access to clean water in Ethiopia. Since then, millions more Ethiopians have gained access to safe water — meaning people like Mehari have been able to lead healthier, safer lives. Of course, statistics can’t tell the whole story. 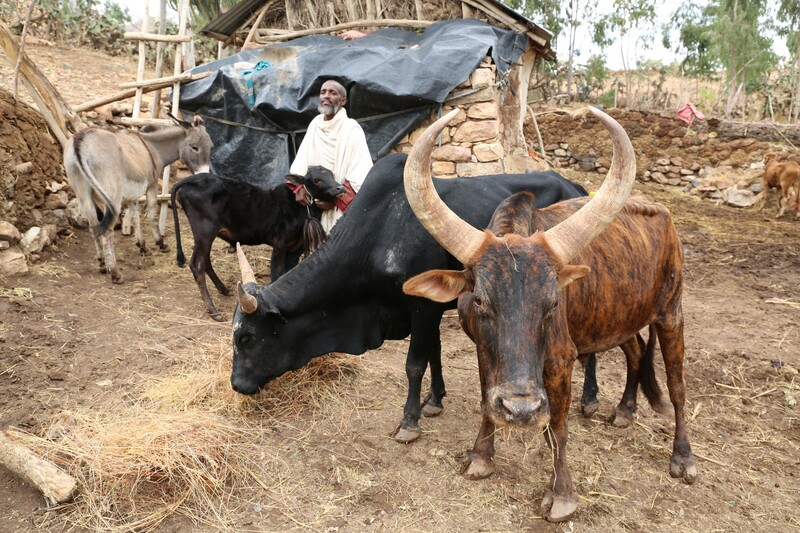 Our Voices from the Field officer Behailu Shiferaw wanted to see what this kind of radical change looks like. 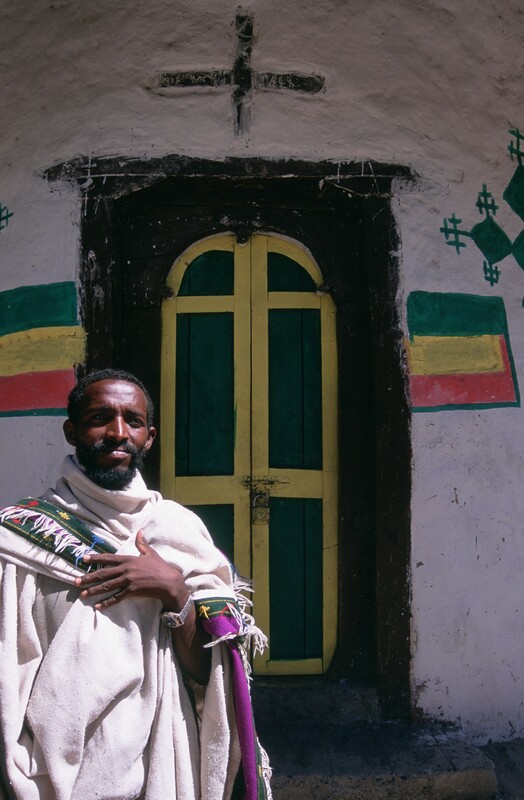 Armed with a bag of old photographs, he took a trip to revisit Mehari and his community. This is what he found. We sat outside his house, on a bench-like structure made of mud and stones. The kids laid a few sheep hides on top of it as they do when they have guests. A couple of oxen, calves and a donkey were casually picking on dried grass at one side of the compound. I pulled out a few pictures and gave them to him. I could see him time-travelling as he inspected each with care. He would occasionally smile and look at his surroundings, then look back on his youthful pictures with surprise. A lot has changed in the last 13 years. If anything has remained intact, it’s his memory of how life was before the water project came. 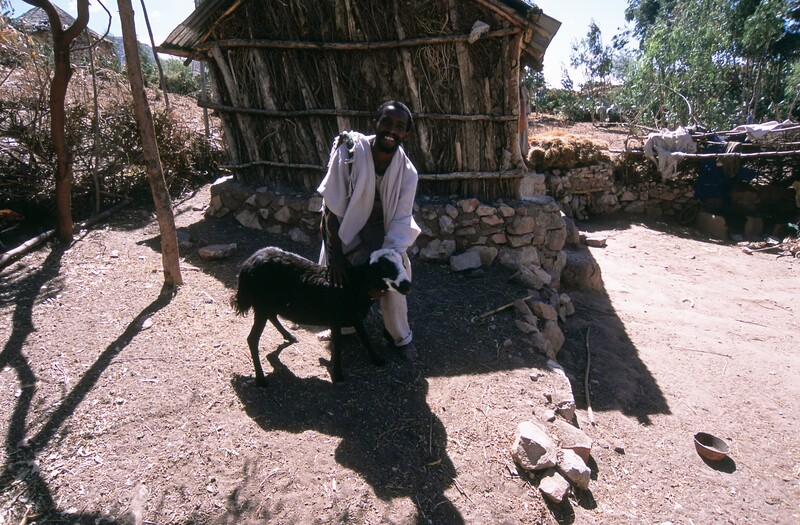 Mehari with one of his first animals in 2004, shortly after a water point had been installed. Photo: WaterAid/Caroline Irby. 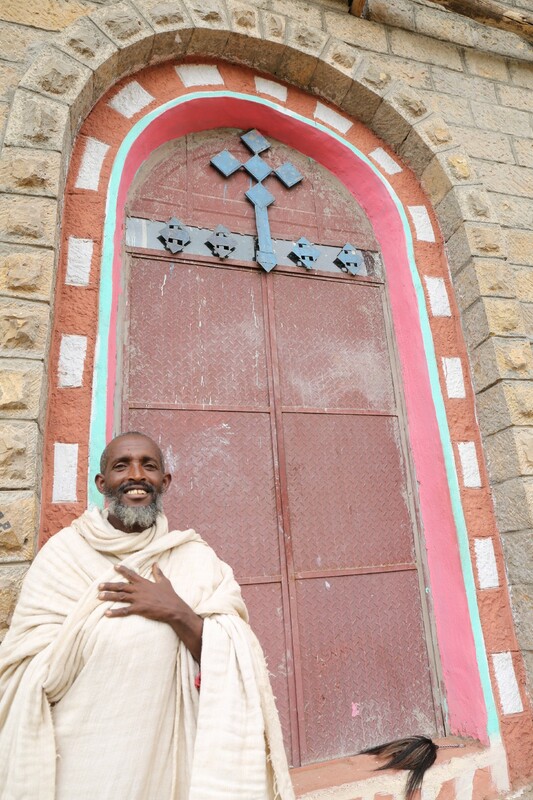 Father Mehari, do you remember this picture being taken? Of course, I remember everything. I was actually hired to do some masonry work at the tap. I bought a sheep with the money I made from the work. I remember that sheep. It was my first. And I bought it for 80 birr. I also told them that since I no longer had to spend my income on medical costs, I managed to save enough money to build a house for 500 birr. What do you mean when you say that sheep was your first? Outside of my land, it was the first animal I owned. I was really poor. I was a young priest and I dedicated most of my time for religious work at church. We were struggling. I spent a lot of my meagre income on medical costs because someone from my family was always sick and I had to take them to clinic all the time. I could barely feed them. Poverty was taking my family down a dangerous spiral. Then the tap water started and my children, my wife and I became healthy. I started saving money. Within one year, I built this house; then I bought a sheep from the savings I had made from my work at the tap. The rest is history. I would like to hear the story. The sheep multiplied, literally. At some point I had about 30 of them. Then I sold them and bought a cow and an ox. Now I have two cows, two oxen, two calves and a donkey with which I transport my agricultural produce to the market. I wouldn’t have afforded any of that — the house, the children’s education, the cattle I have — if it weren’t for the water project. Merhari’s farm in 2017. Photo: WaterAid/Behailu Shiferaw. Mele’at was a little over a year old when she was photographed in 2004. Now 14, she has grown up without ever struggling to find clean water. Behailu shows Mele’at the adorable photo of her rinsing her tiny blue-shoed foot under the newly-installed tap. She doesn’t remember the photograph being taken — she was just a baby, after all — but she has seen a copy of it her siblings keep. They’ve told her what life was like before the water tap arrived in their community. “They used to drink the floodwater from the river,” something she’s never experienced. Ethiopia is a country where about 80% of disease is caused directly or indirectly by lack of access to clean water, sanitation and hygiene education. Mele’at, remarkably, has grown up without any major illnesses. Her grandmother notes what a huge contrast this is from how the rest of their family was raised. 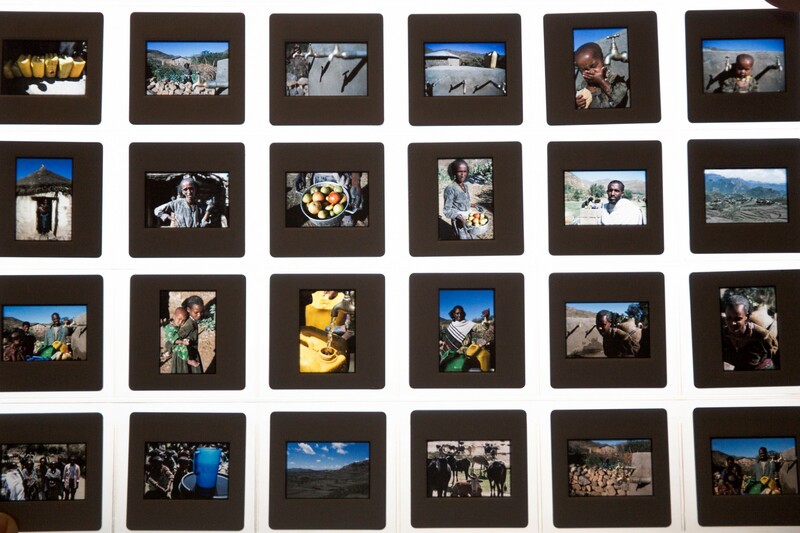 Colour transparencies of photographs taken in Adi Awanawaza, Ethiopia, taken in 2004 by Caroline Irby. The differences in these photos might be subtle, but the details Behailu found capture the incredible progress that water has unlocked in Adi Awanawaza. Father Mehari’s children, and young girl like Mele’at will be the first generation in their community to grow up without water scarcity; giving them a better chance of good health and more time to focus on their futures. This opportunity is one that many Ethiopians still live without. While plenty has changed since 2004, still around 40% don’t have access to clean water. Let’s change that. Become a donor today and help us bring the lifelong joy of clean water to more people like Mele’at and Mehari. We are WaterAid. Our vision is of a world where everyone, everywhere has access to clean water and sanitation - is yours?